As a pixel-styled action RPG that drops players into beautiful, if rocky, high-concept fantasy, No Place for Bravery draws an audience with its aesthetic alone, but its deep focus on character and the truths of human nature explores a space we need more to see more of, and I chatted with dev Matheus Queiroz and the team at Glitch Factory on their nuanced thoughts for the project, moving ahead. 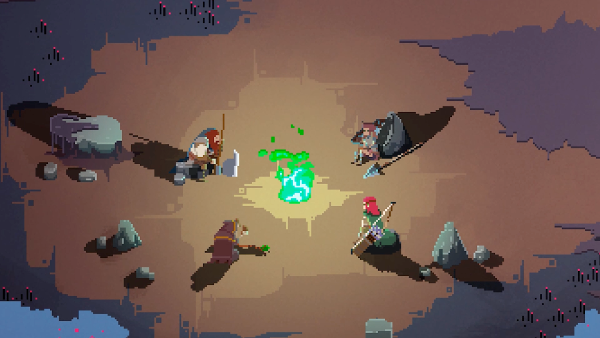 Erik Meyer: The game follows a band of adventurers through a high fantasy world, so speak to the group dynamic; unlike titles like Hyper Light Drifter, there is a team to balance, so speak to the challenges and payoffs that come with a squad on a journey. What in-game mechanics make for transitions and interactions within this experience seamless? Glitch Team: Well, I think we could start this conversation by saying that No Place for Bravery is not the same game as we intended it to be when we released our first trailer. Several decisions were made during this time that changed the game a lot, but we always tried to stay faithful to our high concept. Bravery is, at its core, a satire to the Power Fantasy genre, and we’ll deliver this satire by telling the story of a character called Thorn. Initially, our goal was to tell the story of the world in which Bravery takes place, but, unfortunately, the scope of the game got too big for our small team to handle. Then, we tried to make a “hybrid”, where we would tell the story of a group of individuals, but we ran into some problems regarding the narrative. We sent a demo of this version of the game to fellow developers and the feedback we received was that the game was a little “off”. Basically, we were too ambitious and the game was not coming out the way we intended it to. We were then forced to make a decision, the hardest one we’ve had to make in this project. 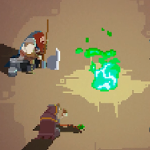 We looked at the game’s core mechanics and decided to cut its roguelike elements and the squad control mechanics. Although we really liked these mechanics, they weren’t fitting with the narrative and the feeling we wanted for the game. So, we rewrote our GDD, this time trying to stay faithful to our high concept. 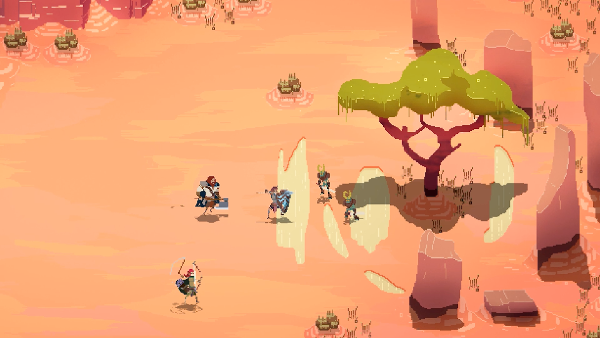 The “new” No Place for Bravery will be a more traditional Action RPG and will focus on the story of one character – Thorn. However, unlike traditional and linear RPGs, the world of Bravery is brutal and subjective. And above all, the world is a reflection of human nature, imperfect, full of flaws and with very thin lines between right and wrong. Bravery was born of a question that was always present in our heads, why do we play power fantasies? Are we conditioned to take certain actions simply because the game is part of a particular genre, in this case RPG? How many times have we stopped to think about the consequences of our actions within a game? Do these questions even matter? EM: As a huge fan of pixel art, I’m excited by the influences you cite: Chrono Trigger, Final Fantasy, Titan Souls, etc. As you’ve designed levels, created art, and moved forward with the project, what do you see as essential, from a visual aesthetic point of view? What do you think people need to see as they walk around in the world you’re creating? Glitch Team: The greater care we must take when we create fantastic worlds is not to say too much about it. At the beginning of development, we were creating this fantastic world, and because of that, we were very excited and wanted to tell every detail of its history. However, talking about all this would make the game too long, as we would have to talk about religions, races, politics and all the topics that make up the world. When we discovered the heart of the story that we were going to tell, everything was clearer for us, especially how to solve the game visually. 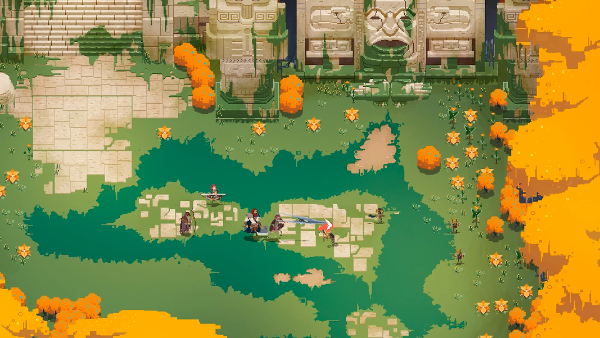 It is important to make it clear that everything the player will encounter during the game is subjective and has to do with Thorn’s personal interpretation of that world. What we consider essential for this, besides Thorn’s own aesthetic transformation, which will happen throughout the narrative, is to see how colors will change throughout the game and how that relates to the story being told. EM: You’ve mentioned that while you focus on the pure action of an ‘action’ rpg, you’re also very focused on meaningful skills and items that directly impact gameplay. I’m curious about what you mean when you say you want your world to be relentless. Can you describe this philosophy from a developer implementation point of view? Glitch Team: Let’s try to answer that one without giving any spoilers. One of our goals and also one of our biggest challenges is to make a game that is not a power fantasy, but that flirts with its elements. So, the world needs to be brutal, it’s in the title, it’s in our high concept. Being a game in which battles can not be solved only by smashing buttons is essential. Thinking from a development point of view, we cut a lot of things in the game, but that was an essential challenge for the experience to stay true to our vision. Whenever we design or prototype something, we try to put the player in a disadvantageous position, and a big challenge is to balance this so that it is not frustrating for the player. The player needs to know that Thorn is only a man, and he is full of vices and defects, so you will never be a superman that will save mankind. He is only a father who has to go through a world that has rejected humanity to rescue his daughter. EM: The ability for smaller teams to develop games like yours has exploded in the last decade, and while established AAA game franchises command a strong following, indie titles like We Happy Few, Children of Morta, and Narita Boy are turning heads and succeeding with crowdfunding. How do you see the change in available software tools, social media, and online sales effecting projects like yours, and what kinds of things do you see shaking up the gaming establishment in the future? Glitch Team: The advancement of technology and the emergence of software that greatly facilitates game development has democratized the industry. The biggest result of this we can observe is the greater variety of topics and types of games being made. Recently, games have ceased to be considered toys and have come to cover deeper more adult topics. We, as Brazilian developers, who have never had experiences in AAA companies, only had the opportunity to develop a game like Bravery because of these technological advances. I think the biggest revolution is over. Today, anyone from any part of the world can be a developer and can develop and publish any kind of game they want. It is hard to imagine another technological breakthrough that will impact the industry like the ones you mentioned. Maybe streaming platforms, but it’s hard to know. EM: Every game universe has the secrets that reveal themselves throughout a game that make the world distinct; can you describe the process you have for pacing the plot developments and reveals (without saying too much)? Without spoonfeeding gamers, what gives a game a feeling of ‘just right’ regarding content and progression? Glitch Team: That’s the million dollar question! Hahahaha. We have a very minimalist approach. We wrote a gigantic script and started cutting things out of it. The “just right” feeling will be reached when we can not cut any more of it while maintaining the richness of detail. As for the revelation of the plot, we will bet on a subjective approach. Always starting from the premise of saying a lot without talking too much and passing the message in a visual way. Nothing will be given to the player; if he is a player who will play without paying attention to details, he will have a very different experience. The game will not expose obvious things. EM: Your team is based in Brazil, and in the context of indie game development, what kind of impact does location (and the local world in which you live) have on the project, as compared to the context of indie games in general? Do you see yourselves as developers first, or does Brasília bring elements to your work that sharpens it in an essential and irrevocable way? Glitch Team: We believe that, just like any other place on the planet where games are developed, the location of the studios brings advantages and disadvantages. The advantages are: currently Brazil is going through an excellent phase for GameDev, especially indie games. There are a growing number of initiatives, both private and governmental, aimed at promoting the production of games, like funding initiatives and also events focused on independent production, all on a national scale. We are passionate about what we do and this incentive boom is exciting for our team, it gives us the feeling that we are betting on the right path. We did not consider ourselves pioneers in this area in Brasília, quite the opposite. Today we share a coworking, the “Indie Warehouse”, with the guys from Behold Studios, creators of games like Galaxy of Pen and Paper, Chroma Squad and Knights of Pen and Paper, and we can count on them for help and friendship. We always strive to emulate the great players here in Brazil like Behold Studios and Aquiris Studios. We also believe that we have a great differential because we are in Brazil, a country extremely diversified culturally, a factor that contributes a lot in our artistic references. As disadvantages, we see the difficulty of attending major events, few job opportunities in large studios, since the market is still developing, and especially the high taxes that affect the games. EM: At this point in your development cycle, what does the day-to-day look like? When you have to make content decisions, what is the team process like? As you look ahead, what stands at the horizon? Glitch Team: Well, we’ve just restructured the scope of the game to accommodate the changes we’ve cited here. Today, we are a team of 8 people, all working full time in the studio. We use Agile as our project management methodology. A few months ago, we started working on a small on-demand project to keep the company going. Keeping a studio with 8 people working for over 2 years has weighed on our budget. But this on-demand project is now finished, and our focus will again be 100% on Bravery. Working on two different games was a challenge, and because of this, some aspects of development have not received the attention due in recent months, which is the case of our social media. This work with the community, creating a closer relationship and talking to our fans will be one of our priorities at the beginning of 2018. It’s been 5 years developing games since we started, first by hobby and now by profession, and we are excited about our future here in the studio. It is an amazing daily learning experience that reinforces the passion we have for games in general.